Pushing The Right Buttons: Frilly and Funkie - Eat, drink and be merry! Hi everyone. Well it's the start of a new challenge - Frilly and Funkie challenge 'Eat, drink and be merry!' and it's my turn to host. So what is this theme all about? As the Northern hemisphere plunges wholeheartedly into harvest time it seemed appropriate to focus on the things we eat and drink. We want you to put together a project that includes food or a beverage (or both if you like) in some way. 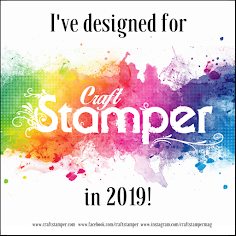 You can use images of them, pick a project that could contain or cover them (a sweet box, lunch bag, bottle cover... you get the idea) or use colours with food/drink inspired names (Mustard Seed/Walnut Stain/Seedless Preserves, for example). You might even want to use food or drink items to help create/colour your project (lemon juice, tea bags, coffee grinds, salt, and so on). 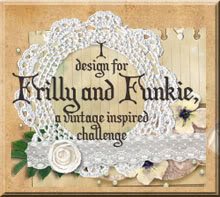 Create your new project, link it to the Frilly and Funkie challenge post and you could be chosen as our winner. For another random entry there is also the chance to win a $25 shopping spree at The Funkie Junkie Boutique! And you can now enter up to 10 challenges in total (including this one) to qualify. So here's my take on the theme. Girly eh? It started with the background, inspired by the work of Vivian Keh (Contadina K). I loved the way she played with texture on her tag and it got my mind racing with possibilities. I started by digging out my yummiest sounding Distress Paints (Spun Sugar, Picked Raspberry, and - ok, not so yummy, Mustard Seed) mixing a little of each of them with white embossing paste. They were applied in a random fashion across the card before being 'textured' with some spare paper. Next came a sprinkling of gold embossing powder, heated to transform. Finally the uncovered card was covered with more of the same Distress Paints. Next came some lovely Venise lace and a strip of pink burlap string. Adding this beautiful lace always makes a card look more expensive and elegant. I also put together a crinoline flower and sentiment using more Spun Sugar Distress Paint. It is so much more opaque than the ink so you get to see the real colour. A focal point for this was easy. The cake image was stamped in Watering Can Archival Ink to stop the edges being too harsh and it was then coloured with coordinating inks, including Wild Honey and Pumice Stone Distress Markers. They blend so beautifully with water. Layer this onto a dry embossed/highlighted piece of Spun Sugar Coredinations card and some plain gold card and there you have it. A feast for the eyes if not the stomach in this case! I hope that your appetite for this challenge has been whetted. 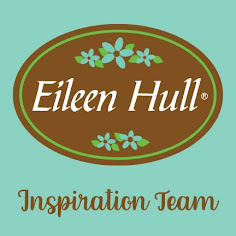 You have two weeks to join us at Frilly and Funkie, and in the meantime I highly recommend that you check out the projects from the rest of the talented Design Team for even more inspiration. and I love that textured area behind the quote!!! The LO is just perfect! Definitely a feast for the eyes - interesting textured background technique - thanks for the link too. What a beautiful card. I love the colours and texture. Yummy background, which I will have to try this one! Jenny, your card is stunning and I love how you displayed the cupcake! Enjoy! Fabulous mix of colours and what wonderful textures in the background. The embellishments ust work with it all so well. Just gorgeous! Wow, that's a gorgeous card, great texture. Love the texture and colors make it so different. It is not autumn or fall for some of us. Here in central Texas it is in the low nineties and the rain has set of a growth frenzy. The humming birds refuse to leave their waiter service at the drink bar. Oh! My!Word! Jenny you have done it again!!! Another wonderful creation I love the "girly" look. The yummy background is perfect frosting for that birthday cupcake. The colours are delicious and the texture - a sensational creation. Wonderful textures and colours for the background and a yummy cupcake-what more could anyone ask for. I wouldn't have thought to put pink, yellow, and gold together, but it looks beautiful. Love how you used the Venise lace, too. And the embosssing and the texture. Outstanding! Oh the texture!!! Gorgeous color on this birthday make! I like your site and your ideas. I will keep an eye on this.